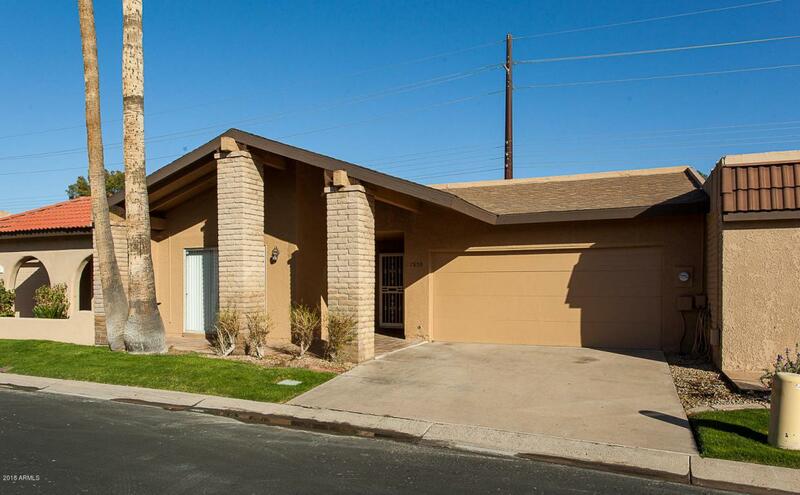 **NEW Price** This very open and split floor plan Patio Home is close to Old Town, the Greenbelt and Scottsdale Fashion Mall! It features a rare 2 CAR GARAGE! The split floorplan makes it great for professionals, couples and rental! In recent years, it was a very successful rental property. The home was remodeled in recent years with Maple Cabinets, Granite Counters, Stainless Steel Appliance. The living room and dining room features newer wood tile flooring. The bathrooms were remodeled and prior to listing the interior was painted and new carpet installed. The home features a double sided fireplace, 2 walk in atriums, walk in master shower and large master closet. The home backs Jackrabbit which feeds into the community and is low traffic.